Get The Gaming System That Lets You Play The Games You Want, Wherever You Are, However You Like! At home, Nintendo Switch™ rests in the Nintendo Switch Dock that connects the system to the TV and lets you play with family and friends in the comfort of your living room. By simply lifting Nintendo Switch from the dock, the system will instantly transition to portable mode, and the same great gaming experience that was being enjoyed at home now travels with you. The portability of Nintendo Switch is enhanced by its bright high-definition display. It brings the full home gaming system experience with you to the park, on an airplane, in a car, or to a friend’s apartment. 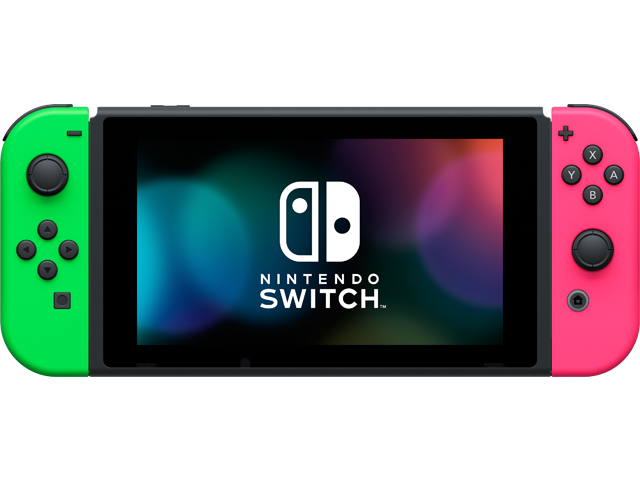 This bundle includes the Nintendo Switch console and Nintendo Switch dock in black, and left and right Joy‑Con™ controllers in a Neon Green and Neon Pink. It also includes all the extras you need to get started. The Nintendo Switch is now available as an Authentic Nintendo Refurbished set only from Nintendo, and it comes with our standard one year warranty. Although it may have minor cosmetic blemishes, it is guaranteed to be fully functional. We think you will find the standards for Authentic Nintendo Refurbished Products are VERY high.